A long-standing tradition of the Corpus Christi Procession in Cork City took place on Sunday, 6 June 2010. In blazing sunshine a very large group of the Catholic faithful marched from the North Cathedral and various other parishes to honour this Feast of the Body & Blood of Christ. 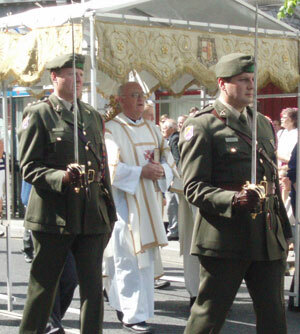 The Blessed Sacrament was carried in procession by the Bishop of Cork and Ross, Rt Rev John Buckley. He was flanked by clergy, members of Oglaigh na hEireann (the Irish Army) and school children who carried the Canopy above the Bishop and clergy. Our picture above shows Fr Tomas Walsh SMA and two members of the Irish Army, Oglaigh na hEireann who traditionally provide a Guard of Honour on such occasions. At Duant Square a temporary Altar was erected and hymns were sung at various stages by the Choir assembled there. 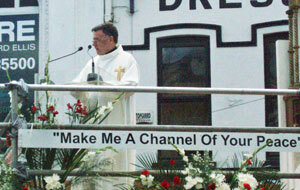 An inspiring and challenging Homily was preached by the Parish Priest of Glanmire, Very Rev Noel O’Sullivan. Below are some of the pictures from the celebration.